"Peace on Earth begins with birth". Hometown: I consider New York (where I live) and Denver (where I grew up) as my home towns. 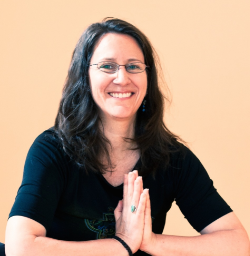 My YTT is one of a kind because: I think it is very important to take the time to honor the deep traditions from which yoga sprang by learning more about the root culture of the practice we all love. Without this context, I feel, we may run the risk of diluting the practice in some way. So, my training offers a comprehensive exploration of the cultural, philosophical, scientific and cosmological roots of yoga; especially as it applies to enrich one's teaching and personal practice. Students in my YTT are exposed to some of the traditions of India including music, food, dance, iconography, puja, literature, sacred sites, esoteric thought, Ayurveda and more. They begin to see that all of these things are deeply intertwined with what we do on the mat. This helps deepen appreciation and awe of the vastness of yoga and ignites curiosity in unexpected areas of study for yoga teachers. To me, the "Yoga High" is: The feeling of inner calm. My Background is: After college, I worked as a program administrator for a social services program, and then took a position as a technical writer and trainer for a large staff development department. While working the usual 9-5 jobs, I was practicing yoga. Soon, I began to realize that I needed to make a shift in my professional life. After receiving my prenatal yoga certification, I supported my sister's birth and realized I wanted to become a doula. Since then, I have supported over 70 births. More recently, I have expanded my teaching practice to include fertility yoga and yoga for the wise woman years. I also have a Master's Degree in Medical Anthropology and Medical Geography. When I’m not practicing/teaching yoga: I study astrology and make birth chart necklaces for people showing their planetary placements at the moment of their birth.